Managing Solid Waste: whose responsibility? Once again streets of Kathmandu start to stink after Kathmandu Metropolitan City (KMC) fail to dispose tons of garbage to its regular landfill site at Okharpouwa. Chances of health hazards are enormous and there are many hurdles to solve this problem but changing our habit in throwing away waste at home could be one best solution. Dumping paper, glass, plastic and bio degradable waste separately will give a good option to recycle them, cutting down the amount of solid waste by 50 percent. 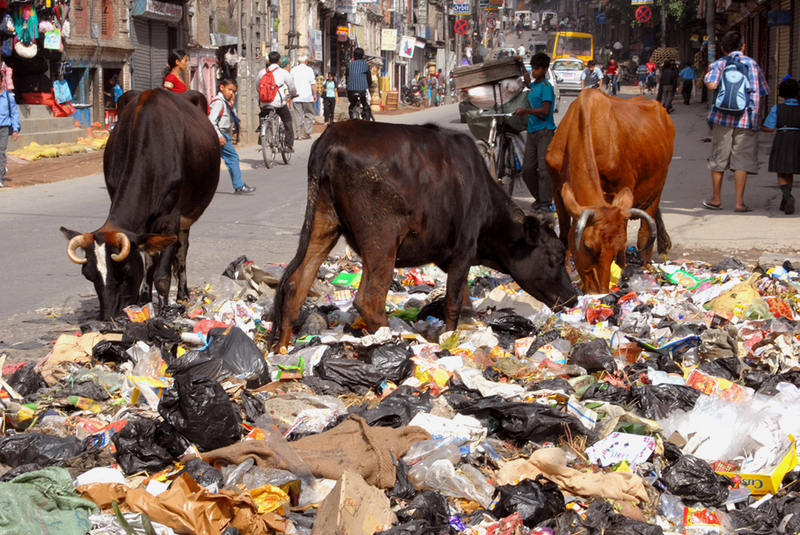 In the pictures: Cows grazing on pile of garbage near Dillibazar.